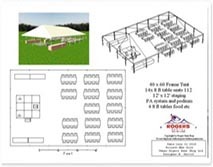 Rogers Rental can make planning your event easier with drawings created with PartyCad. 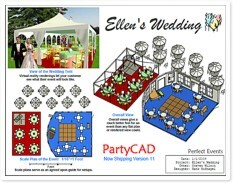 PartyCad is a modern design software program that will allow us to create a floor layout of your event. No more guessing if the invited guests will fit in the venue of your choice. Let Rogers Rental and PartyCad help you in making your event successful. One of the biggest concerns when planning an event is choosing the right size of tent or hall. Our seating chart is a useful instrument that will help you estimate the square footage you need for your event. 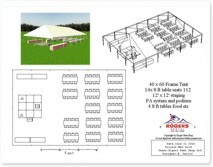 Please consider enough room for the dance floor, podium, buffet tables, bar, DJ, signing and gift tables. Once you know how many square feet you will approximately need, the tent chart will tell you the square footage of our canopies. These are our regular stocked tents, and can be combined in many different shapes and forms. We would love to advise you what the best setup would be for your event. Call 250-374-4321 or email us for more assistance. 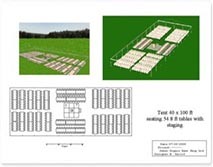 Let us make a tent layout for you. This Cad drawing will allow you to visualize your event from a different perspective. 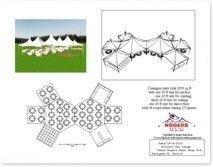 Our drawings are made to scale and will allow you to customize your tent set-up. Marquis tents can be combined in many shapes and forms to accommodate the area. Frame tents are designed for the bigger crowds. Seating over 500 people is not a problem. Be creative! 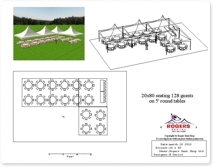 Almost all tents offered by Rogers Rental can easily be combined. Upon request, we can make a seating plan for the location of your event. This can be a tent rented from Rogers Rental, or a hall located anywhere as long as you have the measurements.